In fiscal crises in a number of countries around the world, investors have lost confidence in governments’ abilities to manage their budgets, and those governments have lost their ability to borrow at affordable rates. 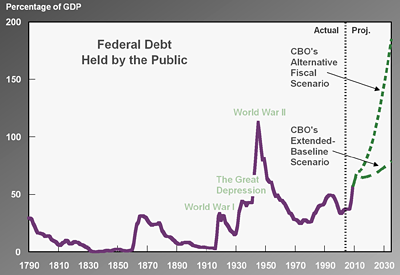 With U.S. government debt already at a level that is high by historical standards, and the prospect that, under current policies, federal debt would continue to grow, it is possible that interest rates might rise gradually as investors’ confidence in the U.S. government’s finances declined, giving legislators sufficient time to make policy choices that could avert a crisis. It is also possible, however, that investors would lose confidence abruptly and interest rates on government debt would rise sharply, as evidenced by the experiences of other countries. Unfortunately, there is no way to predict with any confidence whether and when such a crisis might occur in the United States. In a brief ("Federal Debt and the Risk of a Fiscal Crisis") released today, CBO notes that there is no identifiable “tipping point” of debt relative to the nation’s output (gross domestic product, or GDP) that would indicate that such a crisis is likely or imminent. However, in the United States, the ratio of federal debt to GDP is climbing into unfamiliar territory—and all else being equal, the higher the debt, the greater the risk of such a crisis. The atrocities of the Soviet Union have largely been ignored by history. But, thanks to this award-winning documentary, people can now begin to learn that the Soviet Union committed mass murder and atrocities on a scale that dwarfs that of all other ideologies, states and systems in the history of the world. The deliberate starvation of seven million Ukraines in a single winter of 1932-33 was known to a New York Times correspondent who, instead of reporting it, covered it up. That would make this the single most horrible act of complicity with evil in mankind's history. This is an astonishing video that should be widely disseminated. The Soviet Story is a 2008 Latvian documentary about Soviet Communism and Soviet-German collaboration before 1941. It was written and directed by Edvins Snore and sponosred by the Union for Europe of the Nationas group within the European parliament. The EUN functioned as a parliamentary group from 1999 to 2009, when the political parties within the group, mostly conservative, migrated to other coalitions. More than 40 percent American workers face the prospect of having too little income in retirement and are likely to run out of money, according to a new study by the Employee Benefit Research Institute (EBRI). The share of the population segment at risk for an inadequate retirement ranges from 70.3 percent of households with incomes in the lowest one-third of the population to 41.6 percent in the middle income group to 23.3 percent for the highest income group. Surprisingly, given the difficulties from the financial crisis and the recession, the results find workers better prepared for retirement than a similar study conducted seven years ago. In 2003, by comparison, 79.5 percent of households in the lowest one-third of income were at risk, falling to 47.3 percent for the middle income households and 39.6 percent of the highest income group. Defying the expected pattern, older worker are less prepared than some younger workers. For example, 47.2 percent of Early Baby Boomers may not have enough to live in retirement, while 44.5 percent of Generation Xers may not have enough. In 2003, by comparison, 59.2 percent of Early Boomers were "at risk" while 57.4 percent of Generation Xers were at risk. The study measures the projected time from a worker retirement date until the worker runs out of money, based on what they have saved to far and what they are likely to save before retiring. Not surprisngly, 41 percent of the lowest income group will run out of money after only 10 years in retirement. The study finds that one popular proposal to improve retirement saving and income -- auto-enrollment into plans and auto-escalation of contributions every year -- would make it possible for a 25-year-old work to accumulate twice as much saving as a 25-year-old worker in a plan without the automatic features. Click on the link at the end of this sentence to reach the web page at the Employee Benefits Research Institute where you can download a pdf Issue Brief describing the findings of the study. "Like the Saturday Night Live lunch counter from the late 1970s that, regardless of what the customers reasonably requested, offered only cheeseburgers, chips, and Pepsi, the Mortgage Reform and Anti-Predatory Lending Act (the Mortgage Reform Act) would essentially mandate that all flavors of mortgage loans besides 'plain vanilla' may disappear from the menu," write Krstie D. Kully and Laurence E. Platt at K&L Gates LLP law firm. This section of massive Frank-Dodd financial services bill targets originators of mortgages that are not plain vanilla. These companies and institutions are targeted for "punishment through enhanced monetary damages, defense to foreclosure and risk retention requirements," Kully and Platt state. "Only time will tell whether the mortgage finance industry will assume the risks and expand the menu of mortgage options," they write. So, let me get this straight. Senator Chris Dodd and Representative Barney Frank and Congress refused to address the obvious need to reform and possible do away with Fannie Mae and Freddie Mac? They are in no rush to address the biggest bailout of all time and the chief cause of the housing and mortgage bubbles that led to a financial meltdown that has left millions of Americans and their lives and fortunes in tatters? Instead, they want to punish consumers and deny them any choices other than Fannie and Freddie and Federal Housing Administration mortgages? The only choices are the choices the goverment provides for you. Goodbye, America. Hello, Soviet Union. No wonder the vast majority of Americans are so angry at Washington. These days every decision and law emanating out of Washington takes away our liberties and choices and imposes an unworkable, untested solution that suits the ideology and vanity of the politicians and apparently virtually no one else. Call it ideological self-induglence from people who actually think they know it all. All this is done in ways that make it more difficult and more costly for the rest of us to live, whether from higher taxes or, in this case, the lack of flexible, affordable and preferable mortgage options. The law virtually outlaws Alternative A loans and thereby potentially denies the opportunity to own a home or refinance a mortgage to millions of Americans with good credit and a traditional 20 percent down payment. The Alt-A or low or no documentation loan had a long and successful history as the mortgage of choice for self-employed people. An Alt-A with a sufficient down payment has -- for 150 years -- been a stable and valued mortgage at thrifts and banks and even in the mortgage-backed securities market. The Alt-A was tarnished in the great decline in underwriting practice that occurred from 2005 to 2007 -- when it was provided to wage earners and not the self-employed. It was handed out like candy to people with low credit scores and not to the traditional high credit score borrower. It was given to anyone who could fog a miror with no money down instead of the traditional 20 percent down payment borrower who used these loans. The irony is that Federal Housing Administration is actually making more risky loans that the traditional Alt-A loans that were funded in the market place without government backing. And, in the case of those loans, the taxpayers will be on the hook again. Just as we have been for the bailout of Fannie and Freddie. Clearly, the majority in Congress have learned virtually nothing of value for the nation from the financial crisis. If they did, they are keeping it a secret.